The news about the Republican National Convention held last week in Tampa reminded me of my own experience with the Republican Convention held from August 5 to August 8, 1968 in Miami Beach. I attended the convention as an "aide" for the Arkansas delegation, and was in Miami a few days prior to its start until its end. My expenses were paid, either directly or indirectly, by Gov. Winthrop Rockefeller (WR). While still in high school in 1964, I had done some door-to-door canvassing in Fayetteville for WR's unsuccessful gubernatorial campaign. And during my first two years at the University of Arkansas, I had been active in the campus and state Young Republicans, which had been revitalized to support Winthrop Rockefeller's rebuilding of the party. In 1966, when WR beat Justice Jim Johnson to become Arkansas' governor, I had pitched in as a YR campaign volunteer, and I came to know several folks who worked in WR's famous public relations office, including Judy Petty and John Ward. Through this activities, I had sufficient credentials and visibility to be taken seriously by the powers-that-be when I mailed, from Vienna, Austria, my application -- or supplication -- to go to the 1968 Republican National Convention (RNC). I was thrilled when I was told that I had been selected to go to the convention. In the middle of July, 1968, I returned to Fayetteville from a year's study at the Vienna campus of the Institute of European Study and was scheduled to depart shortly thereafter for Miami Beach. Reading about events in the United States from an observation point several thousand miles away had made me apprehensive about what I would find on my return. Sitting in my apartment in Vienna's 1st district, I heard the news of the King and Kennedy assassinations, the anti-war demonstrations, and the destructive race riots. I feared the country had become unglued, and was relieved to find, when arriving back in Fayetteville, that life seemed as normal as when I had departed for Vienna ten months earlier. Home again, I learned the plans for the trip to the convention. I would be driving from Little Rock to Miami Beach with Everett Ham, another young delegation aide, and two of WR's secretaries (one of whom, if I recall correctly was Sandra Boatright). We would be going to Miami a week early to assist with the pre-convention platform meetings and other organizational activities that WR would attend. We departed for Miami before dawn on Monday, July 29th, with the goal of getting as far as possible -- all of the way to Miami, if possible -- on the first day. Our car was a "vintage" Cadillac. It was huge, black, plush and old -- probably a 1958 or 59 model. According to Ham, we were driving the car to Miami so that WR would have a familiar car for his use there, if he needed it. As far as I know, WR never once got into the car while he was in Miami. Unfortunately, the aging luxury car was not up to the trip, and the travel became an adventure when it broke down somewhere in Mississippi or Alabama, and we had to stop overnight for repairs. The next day, when I was driving the car, we ran out of gas -- fortunately only a few hundred yards from an Esso station. (Ham insisted that gas for the Cadillac be purchased only from Esso -- the successor to Standard Oil Company, founded by WR's grandfather, which made the Rockefeller family one of the richest in the U.S.) We limped into Miami Beach late evening of the second day. The car trip from Little Rock to Miami was not a pleasant one, mainly because Ham was an imperious, sweaty jerk. As a small bug, my dislike of him was unimportant, but the distaste for him developed by WR's secretaries was probably not good for his career. At the time, I did not know much about Ham, who had a flat top and a pudgy, snarly face. I would not have guessed that he had been, only a few years earlier, WR's top aide and confidant. He was hired in the early 1960s, leaving a Department of Agriculture post to be the assistant to WR in his role as Arkansas' Republican National Committeeman. On WR's payroll, he became a blunt instrument -- if a hatchet has a blunt side -- to help WR and his group take over the Republican Party. The folks running the hapless party in the late 1950s and early 1960s were described as "Post Office Republicans" because they often got patronage -- such as appointments to be postmaster of a city -- from the national party in return for their service to a losing cause. Rockefeller wanted to revive the party to challenge the Faubus-dominated Democratic Party. However, to do so he had to get rid of the folks who were complacent with being genial losers. Ham...was a large man with a crew cut, whose total dedication was to Rockefeller and the Republican party. He could be -- and frequently was -- quite heavy handed, excusing it in the name of building a two-party system. Ham knew how to roll heads and he did it. You could go with Rockefeller or get out of the way. The old mossback Republicans did neither. They just got stomped by the growing numbers of Rockefeller supporters. He saw a major aspect of politics in terms of investigations and scandal and gumshoe operations, a game between private investigators and men with secret intelligence techniques. You must "know the enemy,' he would argue. He did not inspire, but in his own way he was as dedicated to the effort as Eisele or anyone else. Ham had fulfilled his role early in the Rockefeller effort, having been instrumental in helping Rockefeller remove the old-guard Republicans who wouldn't cooperate. He thought he knew something about politics. Today, I would not mind having Ham as companion for a 1,200 mile, 19 hour, trip. It would be fun to hear his stories about early 1960s politics in Arkansas. 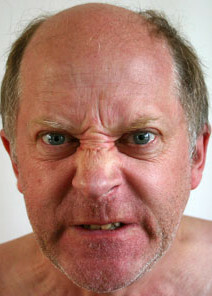 I could ignore his rough edges and laugh at his bluster. In 1968, it was almost unbearable to share the car with such a disagreeable man for the two long days it took to get from Little Rock to Miami Beach. 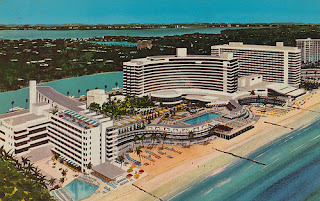 The Arkansas delegation to the Republican National Convention stayed at the beach-front Eden Roc Hotel in Miami Beach, and I had a room there. It was partially owned by Joe Garagiola, former Cardinal's catcher and broadcaster. I know that because one day I was sitting in the lobby when he walked in and sat down beside me. I was thrilled to get to chat with him. I had never been a guest at a luxury hotel before, so it was rube-in-the-city Goll-lly time. I had plenty of leisure to lay by the large pool, and all I had to do for meals was sign my name. 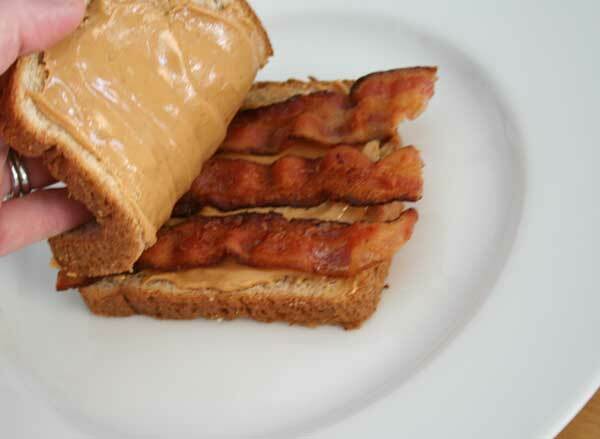 At the Eden Rock restaurant, on WR's dime, I had my first peanut butter and bacon sandwich. I was told that it was one of Elvis' favorite foods. One night I joined a bunch of WR staffers -- mostly PR types -- for a trip to the floor show at the tony Fontainebleu Hotel. Our group got the front-row-center table inches from the stage and filled it with drinks and foods. At the end, we did not divide up the check and tips to pay our shares. Instead, one of the group produced a WR credit card, and we all walked out smiling. I was glad I had turned 21 the previous February. Much of the pre-convention activity was at the Fountainbleu and due to my driving duties (described later), I spent lots of time hanging out there. One day when I was there, I ended up at a party where Jackie Gleason was presiding. He was a rather large man with a mustache and entourage, and he clearly enjoyed food and drink. Soon after we arrived at Eden Roc Hotel, I was informed of my duties. Mainly, I was supposed to go where I was told to go, but also I was designated as a pre-convention driver. That meant that I would be driving people from the Eden Roc to the Fountainebleu Hotel and back again. At first, I thought that meant that I would be driving WR from the Eden Roc to the Fountainebleu. That never happened because he apparently never got out of bed before 2:00 p.m. and by that time most committee meetings were finished Others went to the meetings in his place. I was relieved because I did not relish the idea of driving one of the world's richest men around through the crowded streets of Miami Beach. My problems with driving in Miami Beach were these: (1) I was given a brand new 1968 Cadillac to drive, but it had power steering and brakes, and I had never driven a car with either feature (and, of course, I had never driven a Cadillac, other than Ham's dinosaur); (2) I had never driven in a city larger than Little Rock (and had been nervous driving in such a large city the few times I was there), and (3) I had driven a car only a few times in the preceding year. My regular car was a Plymouth Valiant, which was about half the size of a Cadillac. I managed to do my driving duties without too much worry for the first few days, but on Tuesday, August 6th, I was told that I would be driving WR from the hotel to the Miami airport in mid-afternoon. He was going back to Arkansas, which had held its primary election that day, to claim victory over his token Republican opposition. My heart started pounding. I would be driving a world-famous millionaire through unfamiliar streets amid busy Miami traffic in a fancy car that I could barely control. I sensed the potential for disaster. I probably have never driven so carefully, tensely, and focused as during that trip to the airport. Fortunately everyone arrived in one piece. As I hopped out of the car, hugely relieved, and opened the door for WR, who (unaware that his life had been in danger due to an unfortunate choice of drivers) had spent the trip talking to one of his advisers. I held out my hand to shake it and wish him luck in the election. He looked a bit uncomfortably at the outstretched hand, then placed a folded up $100 bill in it. He mumbled something about giving one of these to all of the "aides" in Miami, then headed for the private airplane waiting for him. I was thrilled. Aside from some driving, I also had a couple of other things I was told to do. They were related to the situation: WR had declared as a "favorite son" candidate for president as a way to keep delegates from committing to Richard Nixon and to support the insurgent candidacy of his brother Nelson. To show the escalating enthusiasm for Nelson's candidacy, crowds had to be created for his events. So, I joined a group of Nelson Rockefeller supporters who traveled to the Miami airport to welcome him to the city. Then, the next day, I went to a downtown rally to cheer for him. It was for naught. It turned out that the insurgent generating the most enthusiasm was at the other end of the political spectrum: Ronald Reagan. Both Rockefeller and Reagan fell short of making a successful challenge to Richard Nixon, who got the nomination on the first ballot with about 52 percent of the delegate votes. The tally was Nixon, 692 votes; Rockefeller, 277 votes; Reagan, 182 votes; and others, 182 votes. WR received 18 votes from the Arkansas delegation. Once the convention convened, I had little to do. A bus took the Arkansas delegation from the hotel to the convention and back. So, there was little need for a driver. 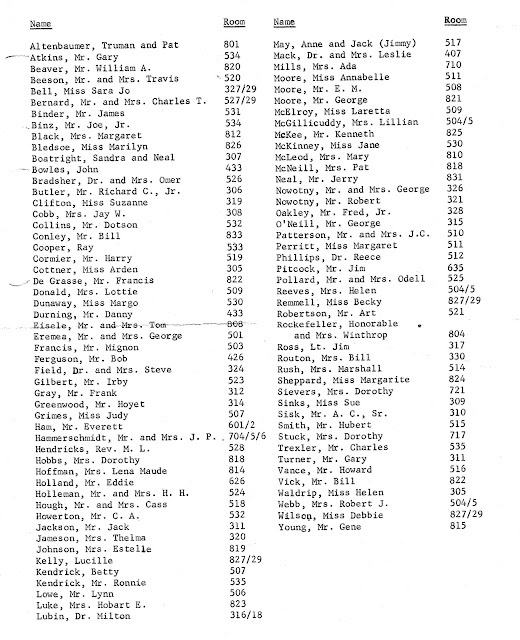 A list of people from Arkansas staying at the Eden Roc Hotel during the convention contains about 112 names. These include the delegates and alternates, state Republican officials, various Rockefeller employees, and young "aides," such as myself. The younger crew included, among others, Joe Binz Jr., Ronnie Kendrick, Margo Dunaway (Arkansas Junior Miss, 1963), Laretta McElroy, and Debbie Wilson. 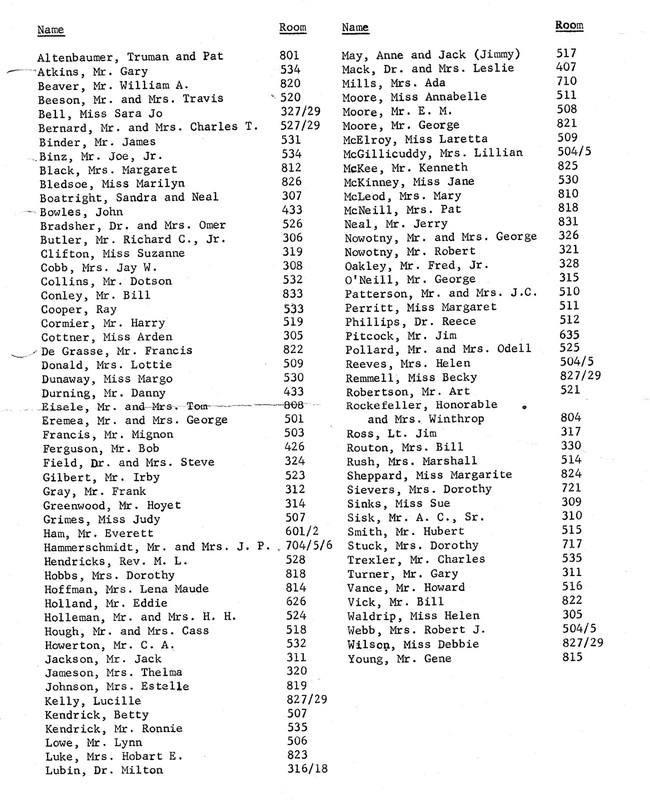 The names of the Arkansas biggies included Truman Altenbaumer, Charles Bernard, Tom Eisele, J.P. Hammerschmidt, Cass Hough, Lynn Lowe, Lillian McGillicuddy, George Nowatny, and Odell Pollard. I watched almost all of the convention from the seats of the Miami Beach Convention Center. I cheered the speeches and enjoyed the spectacle. After having viewed the national nominating conventions, gavel to gavel, on television in 1960 and 1964, it was heady to actually be there to see one live. For a spectator, there was plenty to see, including delegate buffoonery (funny hats, outfits, and signs), famous politicians roaming the halls, and celebrity journalists sitting in the well-lit booths in the rafters and roaming the halls with their cameramen. No doubt the sign was too subtle to send a strong message, and Agnew was nominated with 1,119 delegate votes; 186 delegates voted for George Romney, 12 voted for other candidates, and 16 did not vote. My return to Arkansas was much less painful than the trip to Miami. All of us who had traveled to Miami in the Ham caddy found another way to get back home. In my case, I got a ride with the son of Tom Eisele. We drove straight to Little Rock, stopping only to gas up, taking turns driving. I was a little apprehensive when arriving in Little Rock at about 10:00 p.m. because the city was under a dusk-to-dawn curfew due to some race-related rioting that had been going on. Fortunately, we encountered no problems. 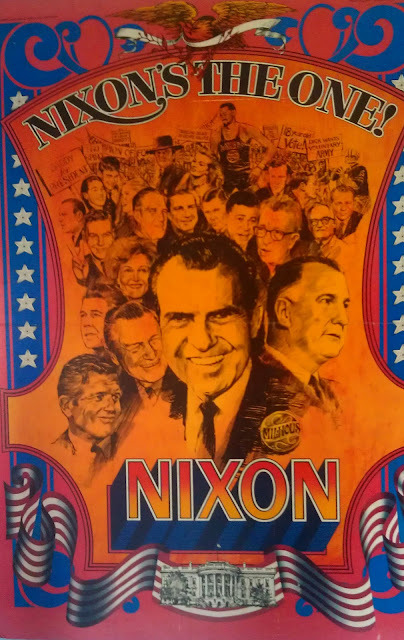 Inspired by the convention, I started a pro-Nixon group on the University of Arkansas campus during the Fall 1968 election. The group, Campus Action for Nixon, opened a booth in the basement of the student union and signed up a surprisingly large number of students as members. The 1968 election featured some major political battles in the state. In the presidential race, George Wallace, candidate of the improvised American Independent Party, challenged Republican Nixon and Democratic Humphrey. Gov. Winthrop Rockefeller was opposed by Marion Crank, the Democratic nominee. And Sen. J. W. Fulbright faced serious Republican opposition from the candidacy of Charles T. Bernard. I was excited because this election was the first time I was old enough to vote. I joined several of the campus Young Republicans to do different types of volunteer work for Nixon and Rockefeller (secretly, I intended to vote for Fulbright, so I didn't go anything for Bernard). We handed out bumper stickers at the county fair and at Razorback football games; boarded a bus to go to the downtown of different cities in Northwest Arkansas to hand out campaign literature; operated a Republican campaign headquarters; and did other "grass roots" actions to support our preferred candidates. 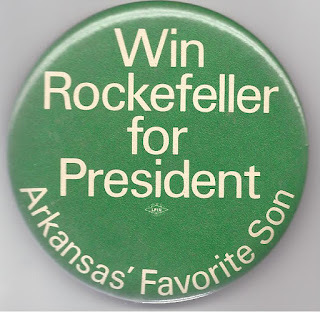 In the end, the election produced strange, puzzling results in Arkansas: Wallace won the state's presidential electors with 33.7 percent of the votes; Rockefeller was easily re-elected governor, and Fulbright won nearly 60 percent of the votes for the Senate. 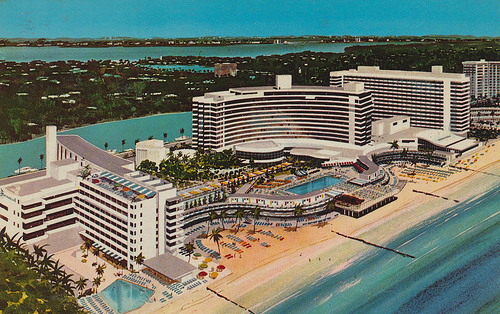 For me, however, the strangest thing about the 1968 election season was my adventure as the driver steering a brand-new Cadillac down Miami Beach causeways with a Rockefeller in the back seat. I'm a student at U. of Georgia doing research on gubernatorial powers and came across an academic article in the State and Local Government Review that you may have written ("Governors and Administrative Reform in the 1990s"). I've been trying to find your contact information to send you a question regarding institutional power-rankings for state governors and legislatures. Feel free to email me at Strickl5@uga.edu.